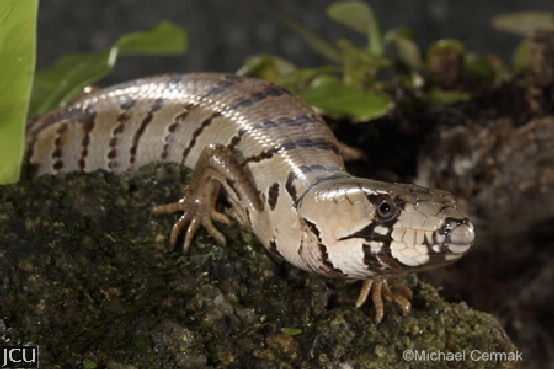 This skink is related to the blue-tongue lizard, but here the tongue is only blue in juveniles, it is pink in adults. It is found in rainforest and tall woodland areas as well as in parks and gardens. Feeds mainly on slugs and snails. The body is grey to brown with black bands extending from the broad head to the tail, bands sometimes absent or obscure. Belly is paler.